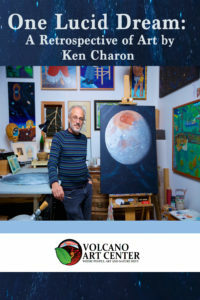 Volcano Art Center (VAC) is proud to announce the exhibition One Lucid Dream: A Retrospective of Art Works by Ken Charon. The exhibit will host a unique collection of original paintings, drawing and other objects created throughout Charon’s long artistic career. The exhibit will be on display 10am -4pm daily at the Volcano Art Center’s Niaulani Campus in Volcano Village from Saturday, September 22nd – October 6th, 2018, closed on Sundays. The public is invited to a free opening reception on Saturday, September 22nd from 5-7pm. Ken Charon was born in New York, U.S.A. July 26, 1954 and moved to Paris, France in 1971. His professional art training began with the American Center for Students and Artists in Paris, and includes the American College of Switzerland the Acadamie Julian in Paris and the California College of Arts and Crafts in Oakland, California. Charon began his professional career 40 years ago with an artistic expedition from his home in Paris to the Seychelles Islands in 1978. In 1984 he moved to Hawaii Island and established his home and studio, the Art Farm, in the rainforest near Kurtistown. Since then, Ken has participated in juried shows and solo exhibitions in Art Centers and galleries on Hawaii Island and beyond, receiving numerous awards and recognition over the years. His work can be found in private collections around the world including those of Al Gore and Barack Obama. This unique collection of paintings and drawings be on display in Dietrich Varez Hall at VAC’s Niaulani Campus located at 19-4074 Old Volcano Rd. in Volcano Village. For more information call (808) 967-8222.